When you have a large number of documents to convert that require either too much resources from the Master server or too much time to complete, you can use other servers to convert documents. By default, the CES remote converter components are installed on Mirror servers. You can also install the remote converter components on one or more dedicated servers (see Installing CES Remote Converter Components). Once you deployed the CES remote converter components on one or more servers, you must configure the Coveo Master server to use them. In the Administration Tool, select Configuration > Converters. 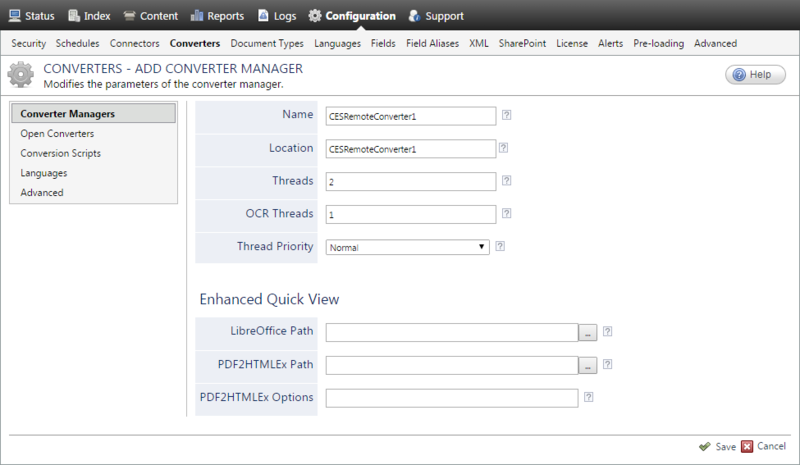 In the Converter Managers page, click Add. In the Name box, enter a name of your choice to identify the remote converter. Example: Simply use the hostname of the Remote Converter or Mirror server that you want to use. In the Location box, enter the hostname or IP address of the server on which the CES remote converter components are installed. In the Threads box, enter the number of simultaneous downloads handled by the converter. Two threads is the maximum recommended for a single CPU, more threads may slow down CES. In the OCR Threads box, enter the number of simultaneous threads to be used by the optical character recognition (OCR) Module, respecting the limit of your OCR Module license (see OCR Module). In the Thread Priority drop-down list, select the priority of the converting process compared to other processes that are running on the Remote Converter server. Example: When you use the remote converter components from a Mirror server, consider selecting Below Normal to minimize the impact on the primary process of the server. Configure the parameters of the Enhanced Quick View section (see Installing the Enhanced Quick View Components). When an error message appears at the top of the page, refer to the following list to troubleshoot the problem, make appropriate changes, and then click Apply Changes. Ensure that the firewalls on both machines are not blocking the DCOM communications between the servers. Ensure that the CES service logon account of the Master server is a specific account that has administrator rights on the Remote Converter server as well (see About the CES Service Logon Account).